is dedicated to provide World Class Cosmetic and Clinical Dermatology, Cosmetic Surgery and Anti-Aging in the most affordable way. We are looking for results driven, experienced and trained professionals to join our growing team. Clinic Set-up, system and procedure. Performs and implement the standard facial procedure. Assist the doctors in all treatments/service being administered. Prepares materials needed for the treatment. Ensures availability of clinic supplies. 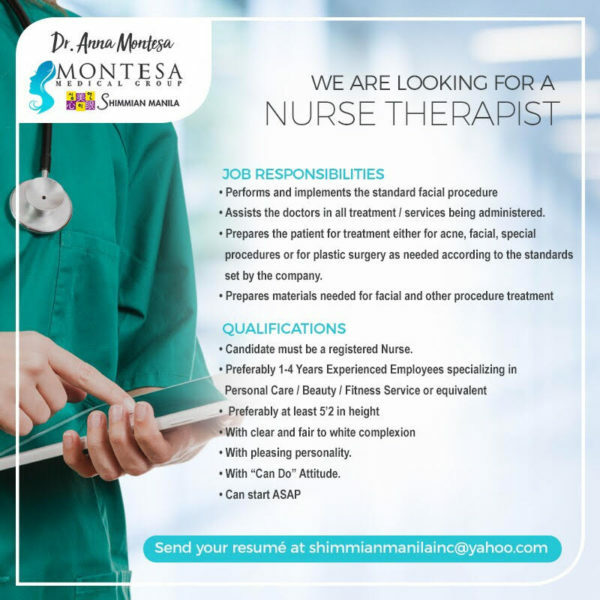 Candidate must possess at least a Bachelor’s/College Degree or Professional License (Passed Board/Bar/Professional License Exam) in Nursing, Medical Science, Medicine, Physical Therapy/Physiotherapy or equivalent. Preferably 1-4 Yrs Experienced Employees specializing in Healthcare – Nurse/Medical Support & Assistant or equivalent. Job role in Clinical Laboratory Assistant/Technician or equivalent. With pleasing personality and good customer service and communication skills. Explains to client the basic about the products and services being offered by the branch. Up sells products to the patients. Clinic set-up, management and administration. FDA filing and follows up suppliers. 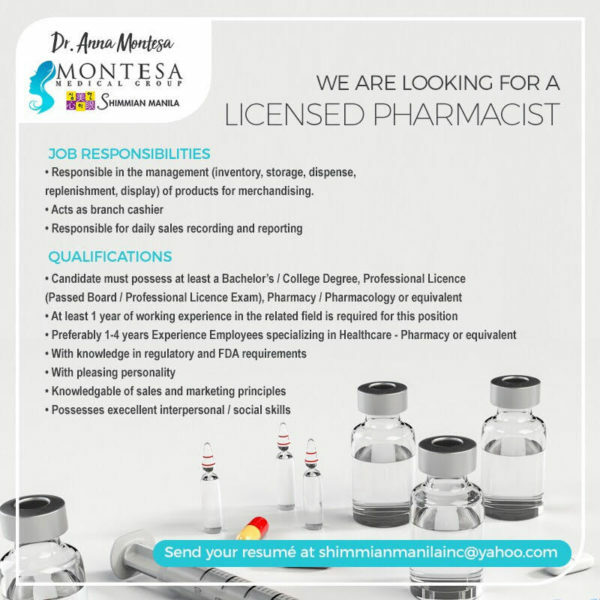 Candidate must possess a Professional License (Passed Board) in Pharmacy/Pharmacology. With knowledge in regulatory and FDA requirements. 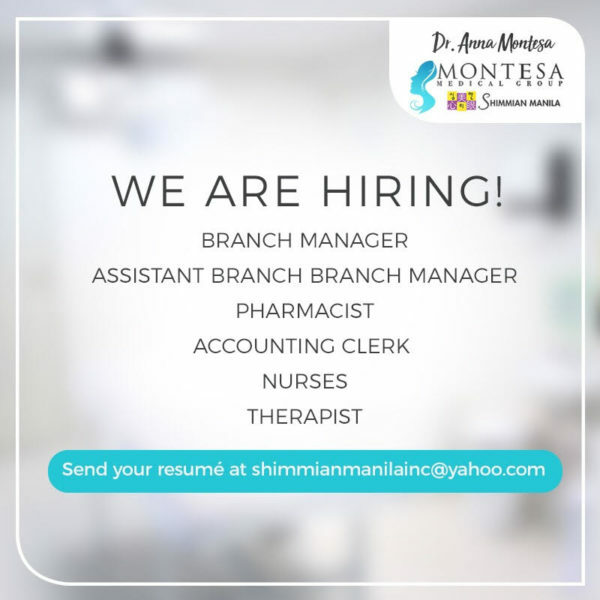 Newly Licesed Pharmacists are welcome to apply. Conceptualizes sales strategies that will help achieve its 100% quota target in coordination with corporate marketing. Ensures effective customer relations management by attending to customer concerns particularly matters of product and service information, as well as promotional marketing activities. 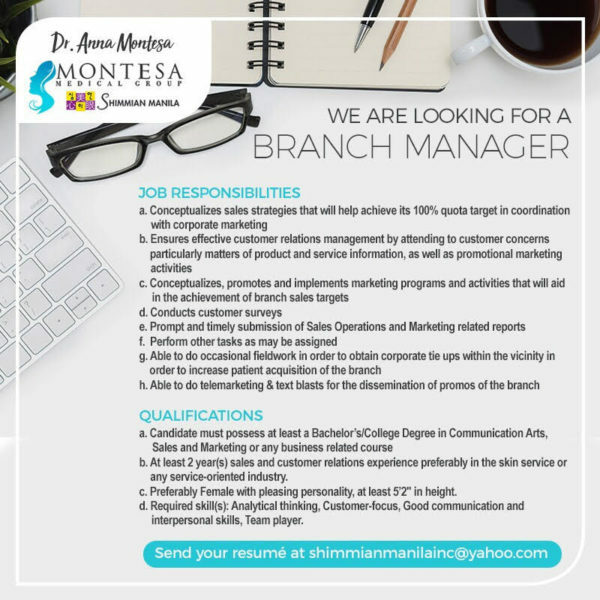 Conceptualizes, promotes and implements marketing programs and activities that will aid in the achievement of branch sales targets. Prompt and timely submission of Sales Operations and Marketing related reports. Able to do occasional fieldwork in order to obtain corporate tie ups within the vicinity in order to increase patient acquisition of the branch. Able to do telemarketing & text blasts for the dissemination of promos of the branch. Candidate must possess at least a Bachelor’s/College Degree in Communication Arts, Sales and Marketing or any business related course. At least 2 year(s) sales and customer relations experience preferably in the skin service or any service-oriented industry. Preferably Female with pleasing personality, at least 5’2″ in height. Required skill(s): Analytical thinking, Customer-focus, Good communication and interpersonal skills, Team player.